Meredith Fletcher: Hays Financial Consulting is an Atlanta-based corporate financial consulting and accounting firm that specializes in bankruptcy... [and] receivership management... and other services. Hays is fairly well known regionally, but [it] turned to us to raise [its] profile on the national business stage. 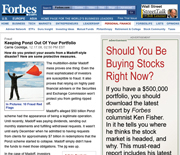 What made Forbes.com a good hit? How did you pitch the reporters? Fletcher: Forbes.com fit... into our target audience: C-suite executives and the financial and legal communities. When the [stories about the alleged] Bernard Madoff Ponzi scheme broke, we... did some research on who was covering it at Forbes.com and pitched reporter Carrie Coolidge... offering... managing principal Greg Hays as an expert on fraud and Ponzi schemes. Did you media train Hays prior to this? What other information did you provide to clinch placement? Fletcher: Since this was a fast-moving story, we only had a few hours to sit down with [Hays] to fine-tune our messaging and talk about the best approach. But the real key to this placement was our original outreach – we provided a “Ponzi scheme-focused” bio along with specific background information highlighting the depth of his expertise and credentials. Fletcher: The Forbes.com story ran the day before a Wall Street Journal piece that also quoted [Hays], which immediately helped expand the visibility of Hays Financial Consulting in the larger business community. The... placement initiated some great momentum for additional media interest... heading into 2009, so the company was thrilled with our work.